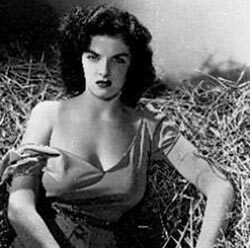 The Outlaw is a 1943 Western movie, directed by Howard Hughes and Howard Hawks (uncredited), which turned Jane Russell into one of Hollywood's movie legends. The film also starred Jack Buetel, Thomas Mitchell, and Walter Huston. Although the movie was completed in 1941, it was released to only a limited showing two years later. It did not see a general release until 1946. The delay was a result of Hughes defying the Hays Code, which set the standard of morally acceptable content in motion pictures. By showcasing Jane Russell's breasts in both the movie and the poster artwork, The Outlaw became one of the most controversial pictures of its time. Hughes even created a new type of bra just for this movie. In 1941, director Howard Hughes, while filming The Outlaw, felt that the camera did not do justice to Jane Russell's large bust. He employed his engineering skills to design an underwired, cantilevered bra to emphasise her assets. Hughes added rods of curved structural steel that were sewn into the brassiere below each breast. The rods were connected to the bra's shoulder straps. The arrangement allowed the breasts to be pulled upward and made it possible to move the shoulder straps away from the neck. The design allowed for any amount of bosom to be freely exposed. Regardless, the emphasis on her breasts proved too much for the Hollywood Production Code Administration, which ordered cuts to the film. To obtain the Boards' required Seal of Approval, Hughes reluctantly removed about 40 feet, or a half-minute, of footage that featured Jane Russell's bosom. He still had problems getting the film distributed, so Hughes schemed to create a public outcry for his film to be banned. The resulting controversy generated enough interest to get The Outlaw into the theaters for one week in 1943, before being withdrawn due to objections by the Code censors. When the film was finally released in 1950, it was a box office hit. Ironically, Russell later asserted that she never wore Hughes' bra, and that Hughes never noticed. Even after Hughes did an "end-run" around the censors, the film was banned on a local level by several towns, but not Bicknell. Saturday Matinee - 2 P.M. 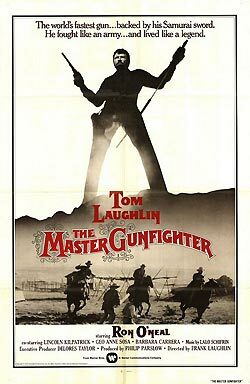 The Master Gunfighter is a film released in 1975, written, directed, and produced by Tom Laughlin, who also played the lead as Finley. 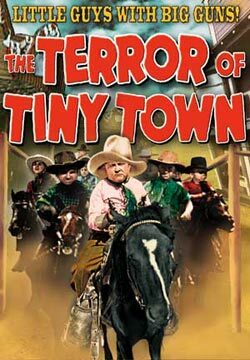 This film is set in southern California near Santa Barbara in the period shortly after California became part of the United States. American settlers and the US government discriminated against the Mexican landowners and frequently took their land by force or legal skullduggery. This film focuses on wealthy Latino ranchers whose land and wealth are at risk. They decide to misdirect a US government ship carrying gold so that it will be wrecked and they can take the gold. To prevent themselves from being caught, they plan to massacre the local Chumash Indians. The hero is the now estranged adoptive son (Finley), a master swordsman and gunfighter, who tries to prevent this while still saving his family. The plot is said to have been based on that of the Japanese film Goyokin. Reviews of the film were not all positive though the female lead, Barbara Carrera, was nominated for a Golden Globe award for her performance. Some reviewers considered it to be anti-establishment schlock, but it is unusual in its depiction both of the oppression of the Indians by the Spanish colonists and of the Spanish colonists by the newly arrived Americans. Quite frankly, that little plot twist is pure genius. The world's fastest parade (55 miles per hour), themed "Ride Off Into The Sunset", begins the festivities on Friday evening at the Chuckwagon Lodge and General Store in Torrey at 7 PM and ends at the Wayne Theatre in Bicknell. All participants are encouraged to dress in their best cowboy attire as well as theme their vehicles accordingly Be at the Chuckwagon at 6:30 PM if you want to drive your car in the parade. Saturday morning July 25 at 9 A.M. starts off with our trademark Swap Meet at the Entrada Institute in Torrey. Bring some stuff to swap! The BIFF "It's a Wrap Party" featuring DJ JD Fox will be held at the Rim Rock Inn and Restaurant in Torrey following the movie. JD Fox is the morning DJ on The Eagle, KLGL radio station. He enjoys sports but feels more comfortable with a microphone in his face. He married the love of his life, Emilee, who is a Central Utah product. Among his loves are eating pizza, watching basketball, and taking his listeners on his vacations! You can hear the J.D. Fox morning show, Monday through Saturday, from 6am to noon on 93.7 FM or at 102.3 FM in Wayne County. Listen on-line at klgl.com.